A sponge-like building envelop conceived by Green Studios as a smart and responsive building material. Designed with physical characteristics that allow it to be easily patched on to any surface. The smart hydroponic skin’s first hybrids were all engineered to sustain extremely HOT and adverse weather conditions. Thus, setting off urban agriculture and futuristic landscapes in challenging climates. With unrestricted root growth, high water retention properties, ideal hydroponic substrate matrix for aeration, UV resistance durability and responsiveness, the smart hydroponic skin has proven to be successful in harsh environments due to its significant advantages. Different Smart Hydroponic Skin Types are engineered to deliver a variety of substrate composition, water retention, insulation and drainage according to environmental conditions, varying from extreme cold to severe heat. Modern technologies have enabled engineers and plant specialists to observe and control critical factors that influence plant physiology. Through the aid of A.I (Artificial Intelligence) and I.O.T (Internet of Things), sensors such as H2O, pH, EC, and temperature are used to identify ideal growing conditions for plants anywhere around the world. A smart hydroponic skin that is embedded with sensors, can be monitored to observe live plant conditions and regulate the system to pre-set conditions. Within an open canvas, plant roots are flexible to spread throughout the layers of felt, finding uniformity in all corners. Developed for numerous applications and many plant varieties including shrubs, trees and vegetables. Scientific methodology has repeatedly observed that the natural process of evaporative cooling in living walls and roof gardens can function as a thermal insulator for building envelops throughout extreme seasonal changes. Studio tests have determined that up to 8Db decibels are insulated by the aid of (GS OR living green wall systems). It is up to architects, designers, and engineers to utilize the advantages of modern building envelop in future building developments. Showing off its lightweight flexible material. The hydroponic skin can be applied to almost any structure and trimmed to fit. Introducing green spaces to places we would once think impossible. Enables users to monitor live green wall status via a tracking application or by connecting to a Building Monitoring System or a Home Automation System. Alarm notifications are sent to our Head Office and to the client in the event of any emergencies. 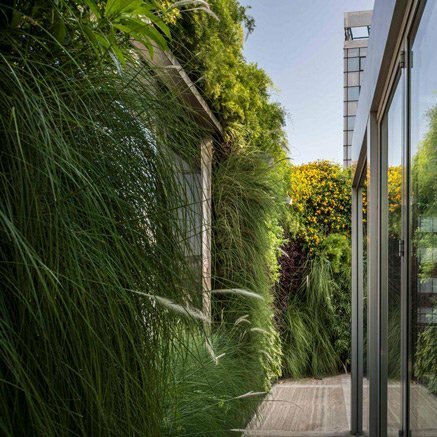 Our systems have been tested under extreme climatic conditions and fine-tuned through the aid modern technology to guarantee remarkable results of living green walls throughout all seasons of the year. The skin is capable of withstanding all extreme environmental conditions and indoor climates as it is also globally responsive and highly adaptable. By furnishing infrastructure with vegetative and thermally insulating layers, the sun’s heat is no longer absorbed deeply into commonly used infrastructure. Whereas heat energy from the sun is utilized by plants that naturally cool down earth’s atmosphere. Plants are nature’s greatest air filters. By re-introducing high plant densities into cities fueled with toxic fumes, air quality is highly improved via natural plant filtration(Phytoremediation) of toxic volatile organic compounds which are continuously released from vehicles, factories and a wide array of intensively-used building materials. Our smart control systems have been engineered and developed for the soul purpose of allowing people from different backgrounds to interact and understand the live status of a living wall/roof garden system. Deforested lands or “Cities” as we call them have been granted an opportunity to revitalize the planet by stimulating the natural photosynthetic cycle through developing ecosystems in once uninhabitable lands. A phone/tablet application can be logged onto from anywhere around the world to monitor the status of a green wall or roof garden system. Moisture percentage, water pressure, EC/pH ranges, and historical maintenance actions are all important aspects that can be monitored by our partners, to ensure the system is functioning optimally. Monitoring through a smart application saves time and reduces the risk of plants dying by a factor of 100.